Vie to one another in good works. When asked what actions are the most excellent, Prophet Muhammad is reported to have replied saying "gladdening the heart of a human being is one of the most excellent of actions". Inspired by the Prophetic tradition which basically is a core foundation of universal chivalry, I would like to introduce the project: "Gladdening the Sacred Hearts." Seed of inspiration for this project formed sometime back in 2006-2007 when I met Priya in Singapore. 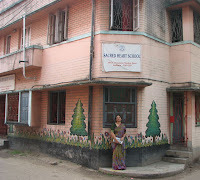 I came to know about the school she runs (called The Sacred Heart School) in Kolkata, India, for kids from many diverse background including from the most marginal section of the society, less fortunate ones, those who come from extreme poverty, harsher economic and social conditions. There are children in her school, who if not supported by her school, could never be able to get education. Because of the very nature of good work, often they go unnoticed from the denser world. I'm sure there are many such schools in third world countries which are doing excellent work to change lives of many, but what caught my attention for Priya's work is because of her utmost dedication and unparalleled sincerity. Without making Priya really mad at me for telling her stories (which is the last thing she want) what I can tell at least is that 'she gives everything she has' for this school. In a third world country like India, the transforming power of education is tremendous. The vicious cycle of poverty for hundreds and thousands of children of the world can only be broken when they are educated and have a sustainable life. The wonderful human potential can't be realized without the light of education. The vision surrounding the Sacred Heart school is giving these less fortunate children that opportunity to break out from poverty cycle. 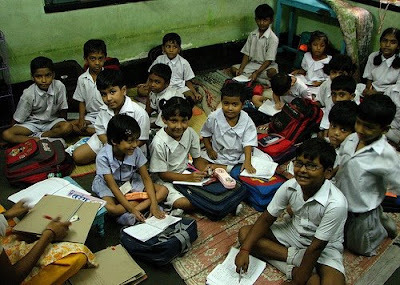 After I came to know about this work, I had the opportunity to visit the school back in Kolkata (famously called, The City of Joy), India and the people who work for it. I really fell in love with the school and the work thats been put into it. Now this school is run completely from individual effort with minimal fees taken from the able parents and help from well wisher, friends. 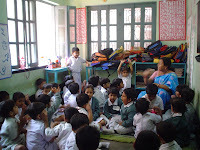 The school based on montessori model, started with only 5 students back in 1993 and now it has grown to more than 250 students (75 students are given education and other benefit for free). Given that its not funded by any outside organization and a solo effort, thats a huge challenge to sustain. The whole process was mostly an individual effort: from the idea of founding such a school, spending from own pocket, even utilizing own provident fund, along with Priya's husband teaching the children, sacrificing own time working tirelessly day and night - all for this project. The reason I can recommend helping in this project is because I have seen it first hand and shown the sincerity of the people who work behind it. We call this project "Gladdening the Sacred Hearts" because each child's heart is sacred and illuminating each heart and enabling them to be independent in this world is to make them happy in realizing their potential. Making impact in one these lives are a worth cause to contribute to. 1. Food for the children: Many of these kids come hungry to the school and their parent's can't afford a proper meal. The school wish to provide them a meal. Back in India it costs very little compared to US currency to feed these kids who come hungry. For example, 1 US dollar is close to 45 India Rupees, which means the cost of a cup of your regular StarBucks Coffee can feed about 4 kids a good morning meal. 2. Education materials: The School provides the education material such as pencils, notebook and also other things like school uniform etc. to the needy students and maintaining such inventories require resources. 3. A new place for the School: With enough contribution, future plan is to move from its current location to a newer place with more spacious class rooms and other facilities. The current place where the school is hosted is quite small with only 3 class rooms in a residence building. It doesn't have playground or enough room for a library or day care facility. 4. Expansion to higher grades: Right now Sacred Heart is a primary school with classes (grades) from one to four. In order for continuously support these kids there are plans to expand the classes from five to eight. Many of us have the intention and the ability but not always the opportunity to create a full sized project from scratch on our own to make real change in this world; thus its great if there is already a existing project where people can contribute from their side, make partnership with it. Priya's Sacred Heart School is such a project motivated by noble ideals and worth partnering with contributions to help it grow. In this quickly passing world where all of us blindly pursue after money and when the time for our last breath arrives, we are made to leave all behind, can not take a single penny with us. This money, after which we run so madly all our life, which often make us blind of everything else - if there is any worth of it, the only real worth is to provide for the needy. So kindly be generous in your contribution if your heart realize that for those you are providing, are your brothers and sisters, are your sons and daughter in this one human family. May this contribution be accepted and counted as your best contribution you ever made. What kind of Contribution you can make? You can make a vital difference in the lives of these children and also their parents. A gift of any size and kind will help maintain current programs and provide the funding necessary for future expansion. So feel free to contribute any amount and be generous in your consideration, may the One Who Provides us all be Generous to you. You may follow the link below to make a donation for the Project. You don't have to have a paypal account and this secure payment accepts all major credit / debit cards. All contribution goes directly to the Project and benefits the students. Once you click the Donate button below, in the next page, after putting in the amount, click (continue) on bottom left of the screen to proceed. We are also in the process of creating a network, 'Friends of Gladdening the Sacred Hearts Project'. The main purpose will be to create an inner circle of ambassadors who can help spread the word, connect to their own networks of friends and encourage others to get actively involved and contribute to the project. If you are willing to be included in the "Friends of Gladdening the Sacred Heart Project" kindly email me with a subject line ‘Gladdening the Sacred Heart Project’ and I will keep you posted about the project, its progress and next steps. Another theme we will be working in the next few weeks is to identify kids with special financial need who can be sponsored in one to one basis. We wish to reach out to as many of these kids possible.
. You may write directly to Priya (priyahome@gmail.com) if you wish to learn in details about the school and her work. Acknowledgment: thanks to my good friend Indraneel for his constant support and motivation for the project. "What actions are most excellent? To gladden the heart of a human being, to feed the hungry, to help the afflicted, to lighten the sorrow of the sorrowful, and to remove the wrongs of the injured. All God's creatures are His family; and he is the most beloved of God who doeth most good to God's creatures." When you do righteous deeds for the least among you, you have done them for me. And they feed, for the love of God, the indigent, the orphan ... (saying),"we feed you for the sake of God alone: no reward do we desire from you, nor thanks".